We take great pleasure in announcing Team IORG. 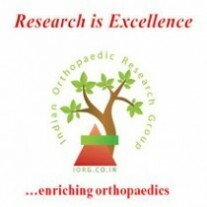 Running a huge organisation like IORG is a team work and we are priveledged to have individuals dedicating their time and effort in making Indian Orthopaedic Research Group one of the most Successful Orthopaedic Research Organisations in the World. Planning and executing WORKSHOPS, Discussion forums, IORG Website and above all Planning, and Performing Quality Research is attained only by Co-operation of a Team. We wholeheartedly thank Team IORG and Hope for Long Association with IORG. A restatement of IORG objectives was deemed necessary to keep us focused on our Goal.